Chinese food as always been a guilty pleasure of mine, but getting take-out or going to a restaurant each time I get a craving is getting pretty expensive for me! Inlight of eating healthier and pinching pennies where I can, I decided to just recreate my favorite Chinese dish – shrimp fried rice. Now I know the best part of fried rice is the combination of flavors and a little grease from the oil, but I’m making things a little healthier by replacing olive oil for coconut oil in this dish. 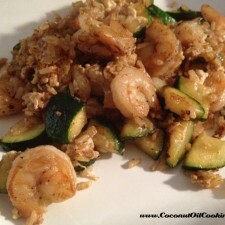 The coconut oil also does a wonderful job of really bringing out the flavor of the shrimp and vegetables that I used. I made this fried rice sort of non-traditional since I had spinach, zucchini, onion and garlic, but feel free to add in other vegetables such as celery, carrots, peas, and whatever else you may prefer. Shrimp is a good source of protein and low in fat as well, so with this, brown rice, coconut oil and a pile of veggies, you’re getting a well-balanced meal. 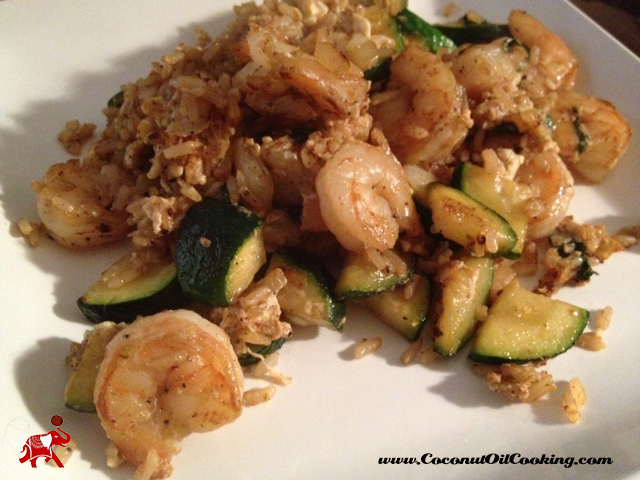 Heat a skillet or wok to medium high heat and add in coconut oil. Next, add in onion and zucchini, sautéing until softened. Place shrimp in a bowl and coat with seasoning and 1 clove minced garlic; set aside. Add brown rice and the remaining garlic into the skillet, mixing all ingredients together. Add in shrimp and pour Bragg’s liquid aminos over the rice mixture. Crack open egg and scramble into all ingredients, mixing thoroughly. I can assure you that making this shrimp fried rice will help satisfy your craving for Chinese take-out AND it’s healthier for you! Feel free to switch the proteins out with chicken, steak, pork or even just stick to plain veggies. Making this recipe with quinoa is another great idea – that’s on my list for next time. For more dishes, check out our Homemade Egg Rolls, Beef and Broccoli, or Homemade Yummy Yummy Sauce.